When measuring Vitamin D, a level of 20 nanograms/milliliter to 50 ng/mL is considered adequate for healthy people. Unfortunately, over 40% of the US population is BELOW the lowest level in the normal range. Do you know what your Vitamin D level is? You should because you could easily be one of the 40% of people who are walking around today with sub-optimal to dangerously low Vitamin D levels. The problem: Aging skin cannot synthesize vitamin D as efficiently as it used to and, to make matters worse, as we age, the kidney is less able to convert vitamin D to its active hormone form. Because of this �double whammy�, both men and women, age 50 and older, are believed to be at a significantly increased risk of developing vitamin D deficiency. The solution: Get your Vitamin D level checked! (All it takes, is a simple blood test.) Then, discuss options with your local health care professional. They may suggest supplementing your diet with Vitamin D3. If so, our 10,000 IU Vitamin D3 is the Purest and Most Potent Vitamin D3 we manufacture! Potent? This tiny, easy-to-swallow soft gel contains a FULL 10,000 IU of Vitamin D3 in a healthful Olive Oil base. Pure? 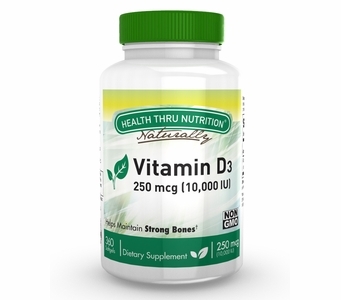 This Non-GMO Vitamin D3 is Gluten FREE and contains NO Artificial Sweeteners or Preservatives. In addition, Vitamin D3 (10,000 IU) is Free of milk and milk by-products, egg and egg by-products, fish and fish by-products, shell fish and shell fish by-products, tree nuts, wheat and wheat by-products, peanuts and peanut by-products, soybeans and soybean by-products. Other Ingredients: Extra virgin olive oil, gelatin, glycerin and purified water. Directions: Adults: take one (1) softgel daily as a dietary supplement or as directed by your healthcare professional. Storage Instructions: Keep bottle tightly closed. Store in a cool, dry place at controlled room temperature 15�C-30�C (59�F-86�F). Do not refrigerate. Health Thru Nutrition� is a registered trademark of EPIC.